Since the last update of Vampire Runner we were experiencing some notorious performance issues on the Android version and that is why we focused our efforts trying to improve it. The main problem was having some stuttering from time to time and some really bad fps on some devices. Fixed the instructions texts to be clearer. Hope this new version works better as it is working for us and enjoy the game. As we mentioned on a previous post, we were having some performance issues in Vampire Runner and we were trying different approaches to improve its performance. One limitation of Android when making games is you have to avoid generating garbage whenever you can since the garbage collection would generate pauses on your games and that leads to a bad user experience. Then, we should try to reuse already created object instead of creating new ones. In Vampire Runner, one problem we were having was that we were creating a lot of entities at a specific moment of the game, when we detected a new obstacle should be created, and that was making some pauses on the Android version. As we use Artemis, we should try to reuse some entities when we can. For example, if we make a shooting game (like the Jetpac prototype I made) it seems a good idea to reuse bullets since their life cycle is really short. Ziggy made two blog posts about this topic some weeks ago here and here, however we followed a slightly different approach and we will explain it in this post. We created a concept named Store (similar to LibGDX Pool class) which let us easily store objects, in this case entities of one kind (for example bullets). collection if there is one or creates a new object otherwise. The idea is to, for example, instead of creating a new bullet when a weapon is fired, calling store.get() and set the component values as they should be, and when the bullet collides with something call the store.free(e) instead of deleting the entity, so we can reuse it later. This is a generic approach and we can use different stores to reuse different kind of entities but it has a big problem, those entities keep being in Artemis world, that means they keep being processed (collisions, render, etc). A basic solution to this problem was adding a new state to the entity, and we explain that in the following section. Artemis supports reuse of entities by internally caching created entities inside the World class, however their state (which components their have) is not easily reused, and that was one of the big problems when creating a new entity, we wanted to reuse their state. Our current solution to the problem was adding a new state to the entities, if they are enabled or not. Being enabled means the entity is processed by all interested EntitySystems, being disabled means the entity is still in the Artemis world but it is not processed by any system. isEnabled() :  returns true if the entity is enabled, false otherwise. In our case, we are using them to enable and disable Box2D bodies in our PhysicsSystem, and also to remove them from our render layers in our RenderSystem. As you can see, when entities like wall, fire and Christmas stuff are behind the main character, they disappear. That is because they are disabled and moved again to their stores so they stop being processed by Artemis, in particular, stop being rendered. By combining both solutions, we have an easy way to reuse created entities of one kind, like our obstacles tiles in Vampire Runner, while at the same time we can disable them when they are on a store to avoid them being processed. In case of Vampire Runner, this solution improved Vampire Runner performance since we now pre create a lot of entities we need during the game and then disable them and enable them only when needed, in this way, we could avoid creating a lot of entities in one update after the game was started. This is a first approach solution to the problem and seems good for our current games but it may not fit other type of games or bigger games, we don't know that yet. If you use Artemis and you had this problem too, hope this blog post is helpful to you. What's going on with the Super Flying Thing? 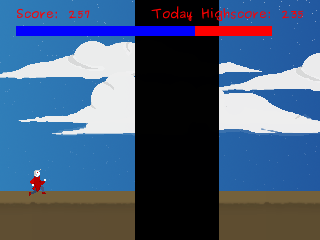 On the last weeks I was a bit distracted working on Vampire Runner and with Mad Jetpack so I ended up kinda leaving Super Flying Thing abandoned, I also have some doubts about which features to work on so I preferred to dedicate time on other projects while deciding what to do with the game. Super Flying Thing is really fun to me, I love the concept but right now the game could be a bit boring and I want to improve that, not so sure how, but I want to try some ideas I have in mind. The main idea of the game is you have to master your flying skills and for that you have to try and fail a lot of times. For that reason, I want to modify the levels to be smaller and harder but not frustrating since you can quickly try again and again. 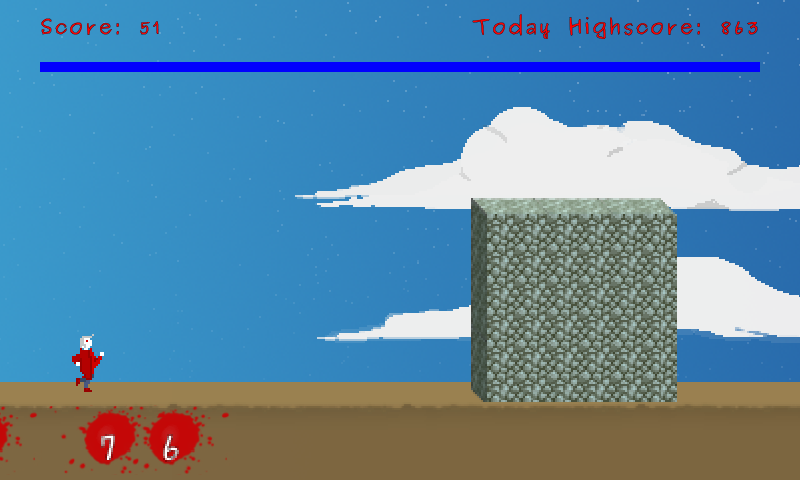 Random levels are now generated using pre generated tiles (I want to talk about this in a dedicated post), so they are a bit more interesting, however they don't transmit the idea of try and fail a lot of times yet, so I have to work a bit on level generation. The practice mode will be removed since you can practice in both challenge and random modes. However, for starters I want to add a Tutorial where you can test the controls and learn how to play to mitigate the change I plan to do over the levels. Also, we want to try an Endless mode where you have to go as far as you can, playing through different challenges each time harder and harder. On some levels there are lasers, moving obstacles and even portals. Despite I love all this stuff, I will probably remove them until I see how they really fit in the game. Stars will be probably removed as well since they don't contribute nothing to the game for now. Again, this will be probably temporary until it fits in the game. On normal game mode, the main objective will remain the same, travel from one planet to the other. However, I want to add a second objective to add challenge factor to the game, something to make the player want to try again the same level several times. One possibility is to add some kind of local competition, for example, improve the time to reach the destination planet, play against your best time, or something like this. Going further with that possibility, maybe publish that replay/best score online and compete with others. We have to dig further in this subject since it can contribute with re playability factor. Now that we fixed the game behaving different on different devices I will rip off the AxisController and the TiltController and probably one more, and leave only the original one plus maybe some other. The original control was modified a bit in order to let the player control the ship better based on how new levels are going to be. That's all for now, the idea of this post is to let you know that I want to to continue this game. Hope you liked it, even if it has nothing interesting. 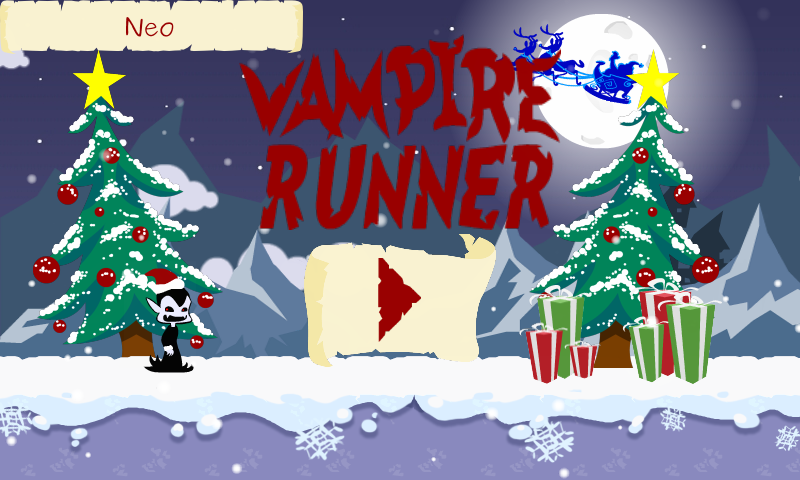 We added some new features to Vampire Runner and also fixed some bugs. Added the best 25 scores during the game (with blood marks). Added an instructions screen showed before start playing. Added pause screen to pause the game and/or return to main menu. Changed game over screen to let you play again faster. Changed main menu screen to show buttons to other screens. Changed the profile name to be limited to 15 characters. If you want to play it on PC, you can click HERE. 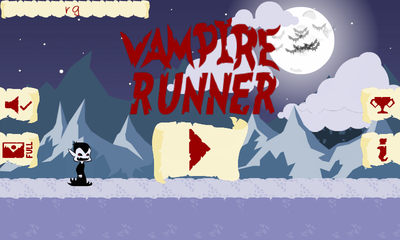 We have published Vampire Runner on the Android Market and added a dedicated page on the Games list. 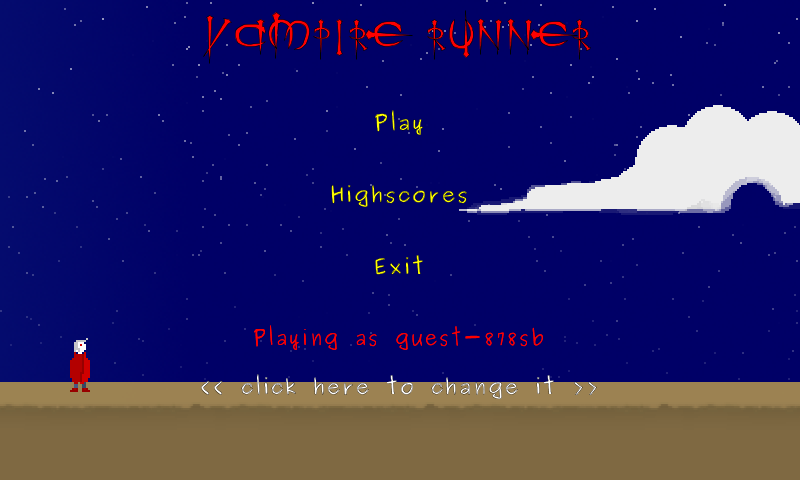 As introduced earlier, Vampire Runner is a Canabalt like game where you have to run as far as you can, in this case as you are a Vampire you have to run from the sun light. For now the game has some issues with of text location on small screen devices, I didn't want to scale everything because fonts look bad when scaling them but could be the only way of making things screen independent. As always, hope you like the game.